Gabe Humphries posted this video interviewing John Stallman, Philip Ong and Dane DuPont--many of you know the names and faces of from the months of eruption coverage thru fb Hawaii Tracker. Thought those of you who have followed along throughout the disaster might like to check this out. Not sure if she lives in one of the last houses on Malama where the lava flow ends, but sure admire her character and determination. This is the 1-hour special that KITV did on "After Disaster" that aired on 12/6. Covers the Big Island and Kaua'i disasters in 2018. Congratulations to Bruce Omori, one of our Paradise Helicopter photographers doing flyovers during the eruption and keeping us informed of what what transpiring on the ground. One of his photos (7th photo down in the article, showing the fingers of lava crossing the land on May 19 ) was selected as one of the Top 100 photos of 2018 by Time Magazine. Congrats also go out to photographer Joseph Anthony for his photo of John Davidson watching the lava spewing from Fissure 16 in the red glow of the night during a full moon (photo 17/71 in the article). John was one of the owners of the house on the ridge behind PGV where Honolulu Civil Beat set up their live feed for all of us to watch; and sadly subsequently John and David lost their house to a fire that swept over the kipuka that the house sat on after surviving rivers of lava on two sides of it. According to the caption, they returned by helicopter to rebuild. Hadn't heard that before. Science magazine has published the USGS report on the eruption. New York Times has a summary. I hope to get a look at the actual report today or tomorrow. Ordinary citizens and outfits like Paradise Helicopters contributed substantially to understanding what was going on. It feels kind of odd that I bought my plane ticket to the Big Island before the eruption started, and the trip was immediately after things had calmed down. Found the report via the link from NY Times. I'm not sure it shows up on the website. It's behind their subscription wall, of course. The outlook is, likely, for Kilauea to be quiet for a decade or so. But maybe not. This graphic should look familiar. Thanks Dave for the heads up! Look forward to sitting down and reading it soon. There were a few memorable photos for me that were featured in the NY Times article, actually 4 that stuck out for me. The first one looks to me to be taken near the field below the Honolulu Civil Beat's house. Thinking that's near where Scott and Bill ventured to get a closer look of the fissures down there. My husband and I spent many dinners at home watching the live feed together while eating and being amazed by what we saw and heard happening down in front of that house. The photo of Halema'uma'u crater and summit back on May 1 was a nice shot back in time. Who could have imagined what would transpire in the days/weeks/months ahead. The fact that we had driven on the Chain of Craters Road right there overlooking Halema'uma'u years before made that a special photo for me. I remember when we trekked across Kilauea Iki's floor and could feel the heat warming our feet, the thought of what was below was a bit disconcerting yet exciting at the same time. At that time Halema'uma'u was quiet and it was Pu'u'O'o that was the attraction in HVNP. Then there was the photo of the flow that had ignited several homes and was approaching the house with the pristine yard and beautiful blue swimming pool. At that point in time you knew this was going to be a massive eruption. The photo featured in the "Eruption's end" section, I know from seeing so many aerial photos of the area, is the last house on the right (east side I think it would be) of Malama in lower Leilani. Had not seen a ground photo close up of the yard/house before, so found it to be an interest vantage point. Looks like the flow which was a massive lava lake at their border was heading their way before it harden and stopped moving in that direction. So much of this natural disaster event, probably one of the most daily imaged captured that I recall, feels just like yesterday in many ways. The images bring back the feeling of being back in time there and I can only imagine how seeing those images again must be for those who had homes and lives in the area. And Dave, like you said, without the efforts of so many it would be hard to imagine how little all of us would know about what happened on the ground. BTW, the Science report is careful to use the glottal stops and other features of Hawaiian spelling. 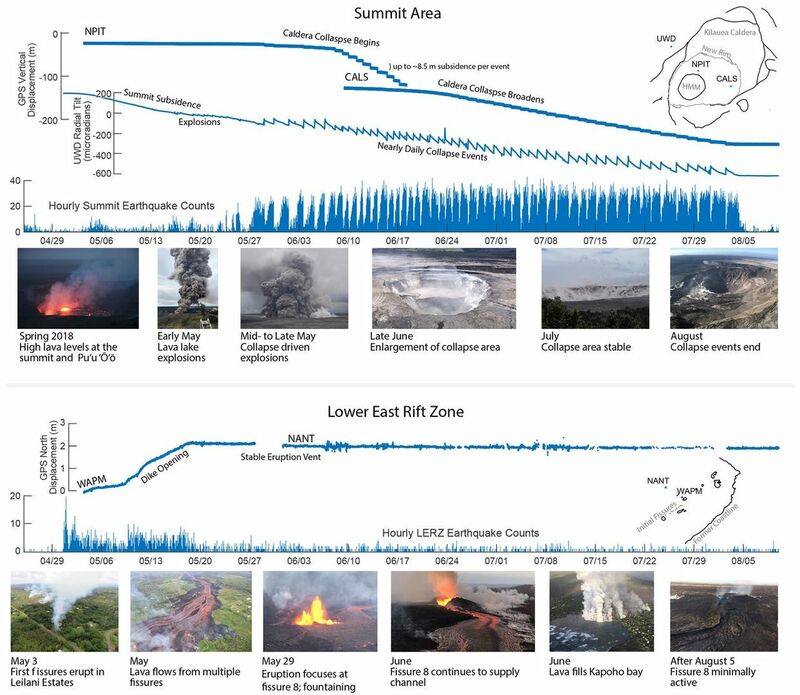 It is careful to make a case for monitoring volcanoes in general, Kilauea in particular. The NY Tines story represents the report well and I concur that it seemed to have a good choice of photos, though choosing among so many must have been difficult. Quick note. Pu'uhonua o Puna (The HUB) had it's farewell celebration party last night as they wound down their efforts. Amazing how quickly they came together to help the evaucees and support them over the long haul. A real role model for disaster relief at the grass roots level. 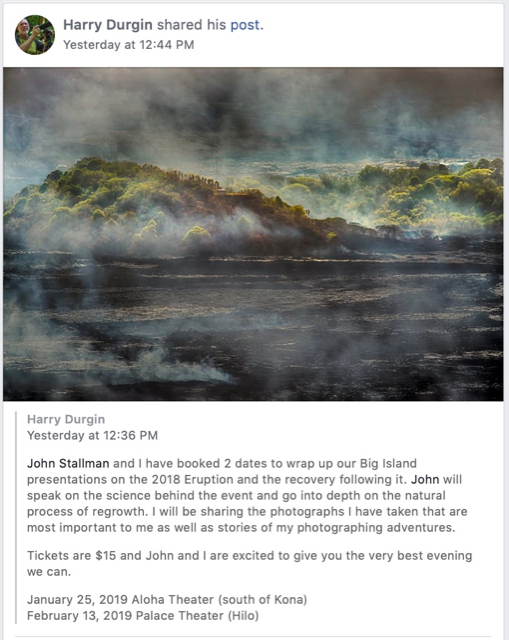 If you are going to be on the Big Island in January or February, you might want to attend one of the presentations that Harry Durgin and John Stallman will be doing on the eruption. A nice story with Howard Dashefsky (KHON2) who surprised the Leilani Estates' Kuamoo family (who lost their home during the eruption) with a year's worth of gasoline courtesy of Aloha Petroelum and Aloha Island Mart. Both husband and wife who work at the Hawaii Parks and Recreation Department and reported back to work one week after losing their home. The Mayor, who looked pretty good after his recently surgery, was in attendance for the presentation. If you know the Kuamoo family, they give an update on their situation as well. With the last Mayor's declaration (6th) some paths to places that were surrounded by lava began. Here's Jeremiah's (YT StrangeHawaii) drone video of the massive road work being done across the vast lava bed from one of the lava rivers that closed off the PGV plant. Knowing how wide and deep these channels are, this type of work is impressive. Can't help but think about the construction workers who do this type of work over hot surfaces (both from below and from sun above) and about the air quality from glass particles, etc being sent airborn as the lava gets disturbed. Gabe Humphries (YT Gabe Humphries) also included drone footage along with his own of the ongoing PGV road work. Another interesting video I thought people might like to check out is Scott's (YT Apau Hawaii Tours) of his trek over the lava to the Pig House at the Leilani Estates kipuka on Kahukai. So interesting to now walk down part of Kahukai to Victor's house now and the view from there and his neighbor's house. Scott meets Victor's neighbor John at his house when John flies in on a Blue Hawaiian helicopter (bring supplies to his wife at the house I think). The walk across the lava field is certainly no walk in the park and while we never did the walk on the lava to the ocean at HVNP, I can see why there are so many warnings to people who chose to do so. Truly amazing work being performed. Gotta admire the spirit of those workers (and the residents!) for pulling it together so quickly. Been a while and wondered how our Leilani Estates community was doing. Saw this article tonight in Hawaii Tribune-Herald about the efforts that the Association and police department are doing to help secure the area there. The Honolulu Star Advertiser had a 11/30 article on a private company that plans to offer a lava viewing area in Puna. Unfortunately the article is subscriber only but here's the link if you are interested. 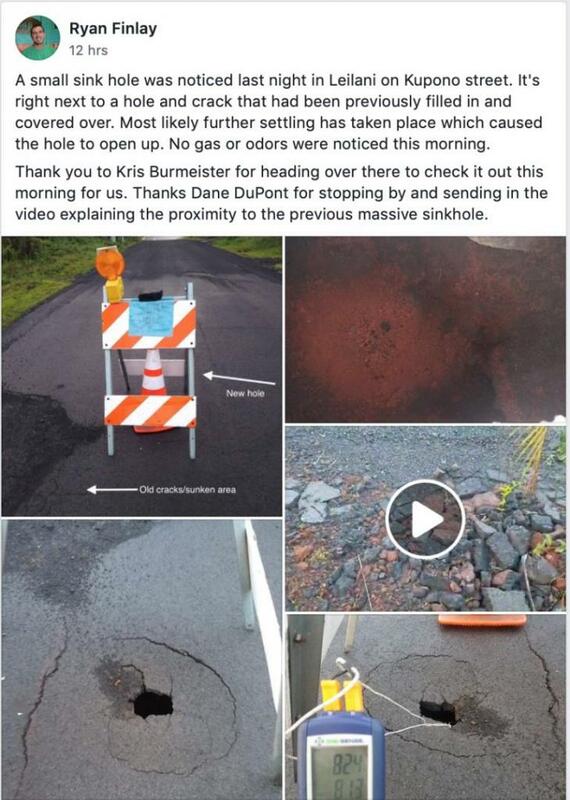 https://www.staradvertiser.com/2018/11/30/hawaii-news/private-company-plans-lava-viewing-area-in-puna/ I have to wonder if this isn't around Jason Twillman's Noni Farms area. I remember he was contemplating locating a site around there for such a viewing area and at one time had a particular house in mind. If anyone subscribes to the paper and can illuminate us on this I'm sure it would be appreciated. Tourism numbers to the Big Island are down yet again. The latest report in West Hawaii Today: http://www.westhawaiitoday.com/2018/12/28/hawaii-news/tourism-still-lagging/ Hopefully in a few months my husband will be able to arrange to visit the Hilo/Puna area with some of his family from Honolulu for a few days. Hopes are that more of HVNP will be open and even a viewing area in the LERZ accessible. 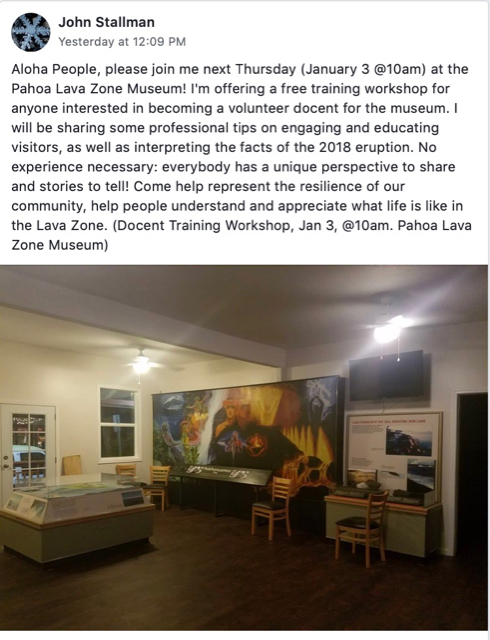 I know the Pahoa Lava Zone Museum will be up and running then. If you've been to the Jaggar Museum in HVNP you may recognize some of the exhibits and murals from there which were brought over to Pahoa to help create a museum there. Hawaii News Now has this "Year in Review" article/video of the Eruption: http://www.hawaiinewsnow.com/2018/12/27/year-review-kilauea-eruption-was-study-destruction-creation/ Many clips and interviews if you've been following this thread will recall seeing. I remember early on when Ikaika was live streaming from near Mohala where the first fissure opened up, we got to see Bo on the scene. Seems so long ago but then still so fresh like almost yesterday. A few videos you might not have seen. Photographer Andrew Richard Hara posted this video to Vimeo entitled "100 Days: 2018 Kilauea Eruption". Won Staff Pick and thought you might like to see. Page Films (mentioned before in this thread and on fb Hawaii Tracker Group) posted "Lava Moon" scenes from his 20-minute film "Volcanic Tides". Happy New Year everyone. Watched two videos I thought you might like to watch. First one from Leilani Estates and the second one aerial footage around Green Mountain (Pu'u Kapoho) with an introduction about the area from Smiley. Scott's (YT Apau Hawaii Tours) recent Youtube video. Interesting perspective of the lava and the steaming fissures. Gabe's friend, Jeremiah (YT Strange Hawaii) shared this video. That lone house with the green roof that miraculously survived being swallowed by the lava is shown and at one point you can see PGV in the distance along with I think Fissure 17 maybe down from the Civil Beats house and then further in the distance, Fissure 8 in Leilani Estates. While checking out YT Strange Hawaii's videos, noticed that Jeremiah also posted a sunrise video at Fissure 8 (Scott was hanging out there at the time and can be heard). Not a great sunrise due to cloud cover. Interesting discussion about drone issues around Fissure 8/10...possibility of magnetic interference? Things are slowly happening in Puna which is great to see. Some homeowners have been clearing their lots and assessing what repairs need to be done. Some plant life is emerging in the lava and around the steam vents. Will be interesting to see how the palms in the affected nearby areas do in the coming months and years. News from Leilani Estates. 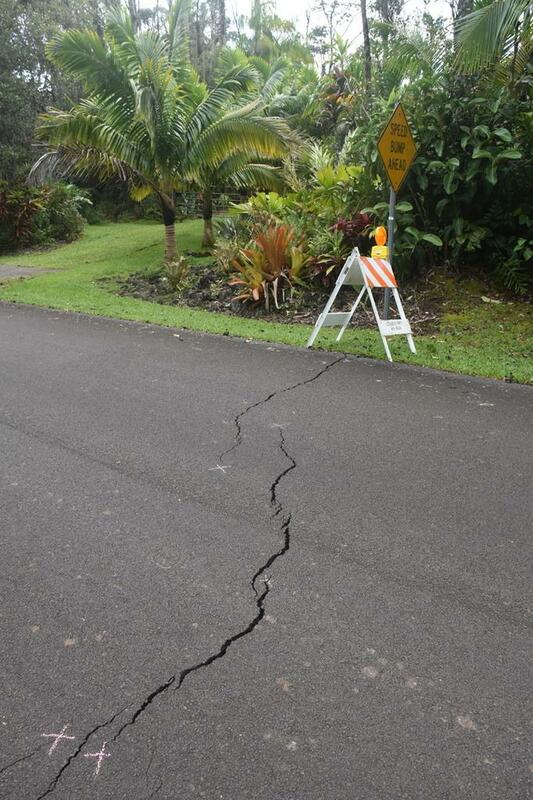 Some settling going on within Leilani Estates as reported on fb Hawaii Tracker Group. In the news is also some new steam cracks causing issues off Hwy 130. 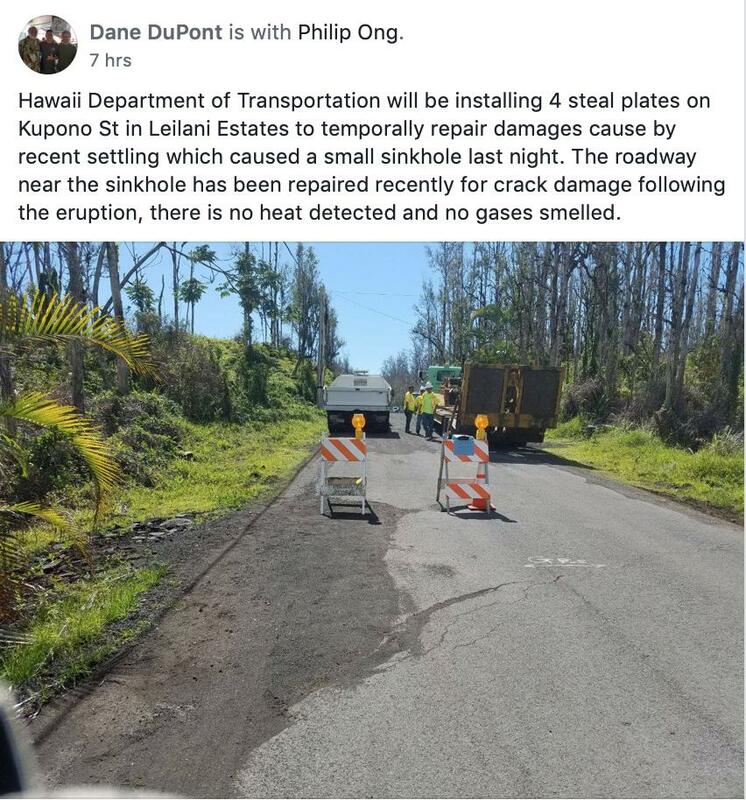 Months ago when people were first reporting cracks and steaming along Hwy 130, Ala Ili Road was closed off to traffic at one point. If you were following the news from back then, you might recall this area generally fell in a line from the Summit to Leilani Estates where the fissures broke out. Last month I read a similar article in Hawaii Tribune-Herald about Heidi Austin's steam vent property in Leilani Estates and the plight she has been having getting any kind of assistance. LOL I stopped the video and I told my husband I thought that was right outside your lot (remembered when you first posted about it but that was a long time ago). Nice to have it verified. Don't recall but did they use your photo or video footage from there? I'm sure people who hung out here on this thread from the beginning and kept up with the photos, videos and news felt a lot of deja vu watching the NOVA special. It did make me wonder how those directly affected by it felt about specials like this. I did enjoy the focus on USGS's ground crew and the drone group's coverage. Being a NOVA science-oriented program I was glad that the governmental response was minimal. Kim, how are things doing in your yard? Do you still find tephra around or has it broken down? What palms seemed most affected? Were the palms in your photo affected by the gas emissions? That was video footage, and I can't identify the woman speaking and pointing out the crack; no idea who it might have been. Yes, I still find the lightweight chunks of tephra sitting on palm fronds and in bromeliads, but most of it has been cleaned up. The greatest measure of the palms are doing fine, but I lost several: most of my Dictyocarium lamarckianum (one remaining alive), lots of palms with very skinny trunks, such as Dypsis mirabilis and Dypsis procera, though a few survived. Lemurophoenix were quite damaged by the SO2, but they appear to be in recovery with new spears emerging. All the palms in the photo are taller now -- no ill effects at all. The response to SO2 seemed very species-specific. Reinhardtia latisecta shriveled up and died, but Hydriastele beguinii 'Obi Island' right next to them merely suffered a few brown leaves. A completely crisp and dead Medinilla magnifica was right next to a perfectly healthy Crinum lily. Some bromeliads were complete toast, while the larger Alcantarea species were fine. Leilani had an extraordinary amount of rain in 2018. The normal range is roughly 140 inches, but rain was measured at over 250 inches! The palms were happy with that. During a recent stay I made a visit to Floribunda and then planted 18 new little palms -- that was super fun. Mostly they are different species from what I lost. It was a huge thrill to be at my place, knowing what great good fortune it is to still have a wonderful tropical garden, all green again. The degree of appreciation was definitely heightened by the sea of hard lava just 2 streets away from my place. Science magazine featured research on the Kilauea eruption in its last issue for January. I was busy that week so need to catch up. I finally read the report (I was out of town when it was published). No surprises, but he authors were very careful to explain the value of having an ongoing Volcano Observatory. While the most likely prognosis is for things to be quiet for a while, the huge amount of magma moved from the summit may allow fresh magma to rise relatively quickly. That's not exactly the carefully guarded wording, but I think close enough. A number of interesting things are happening in Puna and Leilani Estates over the last month. Haven't had much time to update here but here's a few things I think people will find interesting. I'll focus this post on videos I've come across. Anthony Quintano (formerly at Honolulu Civil Beat) was originally staying very near the initial erruption site of Fissure 17 close to valley floor watching a house for someone and filming until it became too much and he was offered a place to stay and work at John and David's house higher up on the hill where Honolulu Civil Beat's ended up filming their live feed from. The house was down just a bit from the PGV plant. It's location is recognizable in some of the footage as being the house with the cell tower next to it. This first video contains amazing video taken while at John and David's house. For those that sat up day and night checking in on the live feed it's a recap, but for those that are only now checking in on this amazing act of nature for the first time, it should be something spectacular to see up close like this. Spans a number of days. Beautifully shot in 4K. In the background you can hear Anthony, Joseph Anthony (accent), and "WXChasing" (Brandon Clement). Brandon is a storm chaser who came to Hawaii for a different kind of nature to film. This next video of Anthony's is incredible drone footage take as Fissure 17 was just forming and shot from overhead (not just from the view of the house). I don't recall ever seeing this footage before and it's interesting to see how it progressed over time. BTW the house Anthony was originally staying in can be seen a few times from the drone, right down there near the fissure line of lava on the "valley floor". The cell tower and PGV can be seen off in the distance on occasion. Another video I found interesting was this video composite of USGS LiDAR of Fissure 8 and drone overflight footage taken by Joseph Anthony.